In the first part of this two-part blog series, we introduced FarmBot as one of a growing number of technologies emerging in order to combat pressures on the farming industry. The FarmBot Network shows how innovative technology and forward thinking could be the answer to sustainability in a rapidly expanding population. In this post, we explain the concept behind the network which won the NTT Data Hackathon Award in 2017. Last year, global IT innovator NTT Data opened the floor to NTT Data partners in an event that demonstrated the advanced capabilities of digital technology. The NTT Data Hackathon invited participants from its group companies to present exciting new ways in which IT can be applied to real-life challenges. As part of the NTT Data network, itelligence welcomed the chance to take part and presented a project that would see them win the award for 2017: the FarmBot Network. The FarmBot Network is a collaborative project between NTT Data and itelligence which uses technology developed by Rory Aronson and his FarmBot startup. The concept was created as a solution to sustainable food production in times of growing food insecurity. 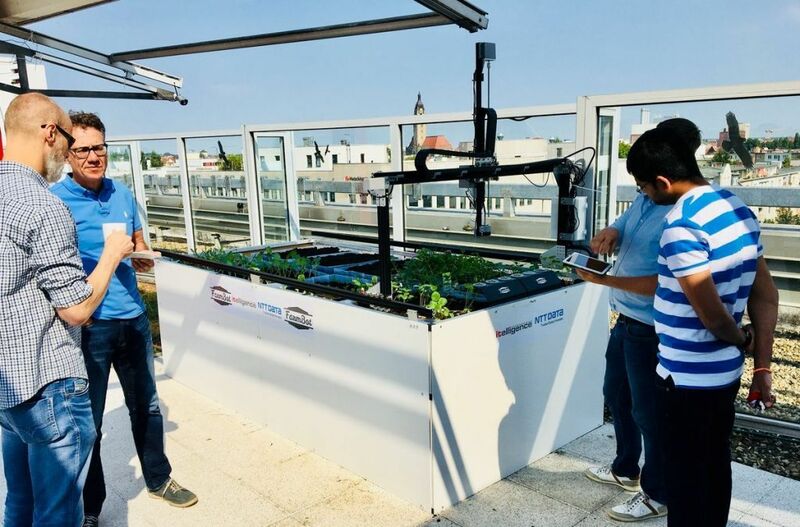 itelligence bought several “bots” from Aronson and installed them in numerous NTT offices to showcase how they can be used for urban farming – an important aspect of food security and sustainability. As FarmBot is open source, itelligence wanted to demonstrate how these bots could be easily connected with the Internet of Things (IoT) and enhanced with cloud technology and machine learning. Connecting the FarmBot to SAP Leonardo and the SAP Cloud portfolio provided much greater capabilities. Smart infrastructures and digital imaging provide a game-like interface where users are able to see their plot live, gain an overview of plant status, control the bot remotely, and keep track of activities – all from a laptop or mobile device. Users are even able to access a smart marketplace to buy and sell produce based on location where trust is established through the use of blockchain. Take a look at how itelligence sets up its FarmBot in this short demo. FarmBot enables precise sowing, watering, and fertilizing according to each exact plant. This allows users to grow a diverse crop which encourages biodiversity and a much higher resilience to pests and disease. Previously, such crops would be very labor intensive, but with automation and AI technology that detects and eliminates weeds, diverse crops require much less work. This polyculture method has been shown to have many advantages over a monocropping method. Although individual robots cover a small-scale plot, the FarmBot startup is already introducing a larger Genesis XL model and encourages you to “hack your bot”. Modifying FarmBots with larger frames, and connecting them in the ways that itelligence has, creates the possibility of a much larger scale set-up. Initiatives such as these give us a great sense of innovation and excitement, as they open the door to developing a more sustainable future – and not just in terms of company sustainability. The FarmBot Network has turned some of our employees into smart farmers and already formed a community within itelligence. The project acts as a small-scale representation of how urban farming could create a smarter and more social way of living in urban spaces. Collaborative projects with our clients encourage innovation and help us to discover new ways to apply their products and solutions. In turn, these could change the way we live, work, and farm in the future. itelligence continues to work closely with FarmBot, developing new software AddOns and technical additions such as sensors which will be announced soon. You can stay up to date by following the hashtag #FarmBotNetwork on Twitter and LinkedIn. Matching Different IoT Ecosytems – Part 3 – Is the Classical ERP System Dead?